Love sweet and salty snacks? 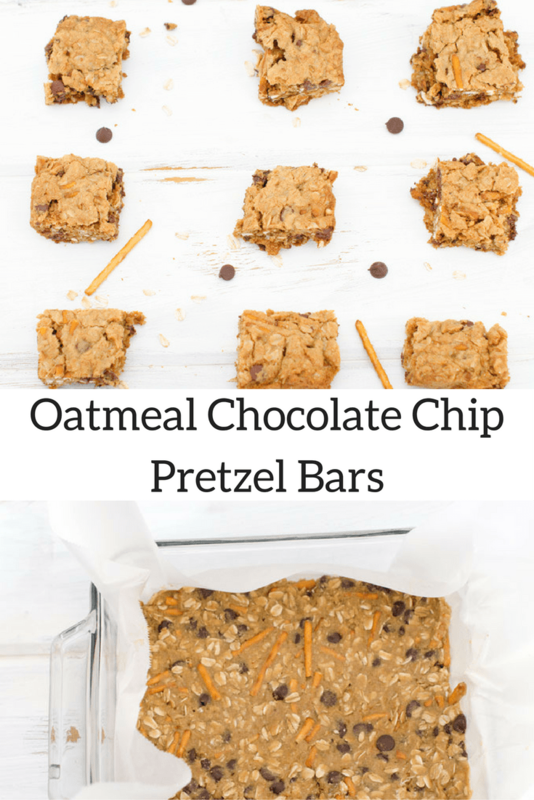 If you also love oatmeal this oatmeal chocolate chip pretzel bars recipe needs to be at the top of your list to make! Smart Savvy Living received a complimentary Mockmill in writing this post. One thing that has become more and more important to me is making more convenience items at home that I previously would have bought pre-made. This includes things like cream of soups and spice mixes. Something I have really wanted to try but was a bit apprehensive about is grinding my own flour. I’ve been baking since I was a kid but have always been afraid of how things would turn out if I made my own flour. So, when I was given the opportunity to try out a Mockmill for my KitchenAid mixer, I thought it was the perfect opportunity to give it a try. 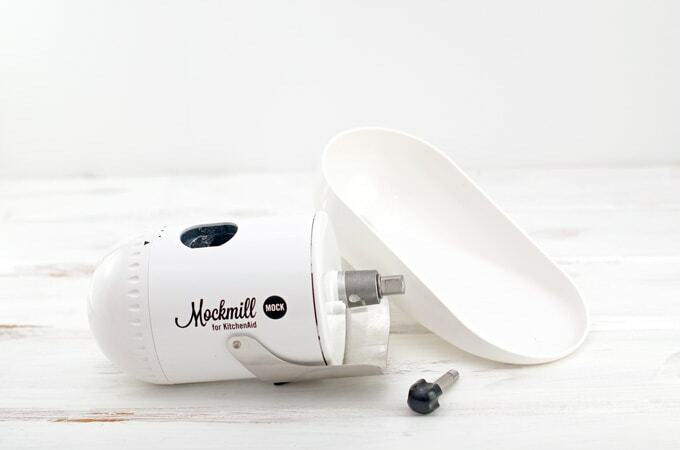 Mockmill is a grain-milling attachment that uses a stand mixer, such as KitchenAid and Kenmore mixers. Grain-milling attachments haven’t been overly popular in the past due to lack of quality and performance, being hard to clean, and being something consumers aren’t overly familiar with. Mockmill was made to change all of that. I was impressed with just how fine of an oat flour the Mockmill produced. If you’d like to try Mockmill you can get the Mockmill starter kit (includes the Mockmill plus several pounds of grains to mill (including a gluten-free option), and the Flour Power book which will introduce you to the benefits of home milling along with tips and recipes) for just $179! The price is normally $259 but when you use the Mockmill coupon code smartsavvyliving you’ll save $80. Don’t wait, though, because this deal is only good through August 31, 2016! Why Mill Your Own Flour? You may be asking yourself why you’d want to mill your own flour when you can just go to the store, buy a bag of flour, then return home and start baking? For me, it’s a matter of knowing exactly what’s in your flour. After all, contaminated flours have been in the news recently. 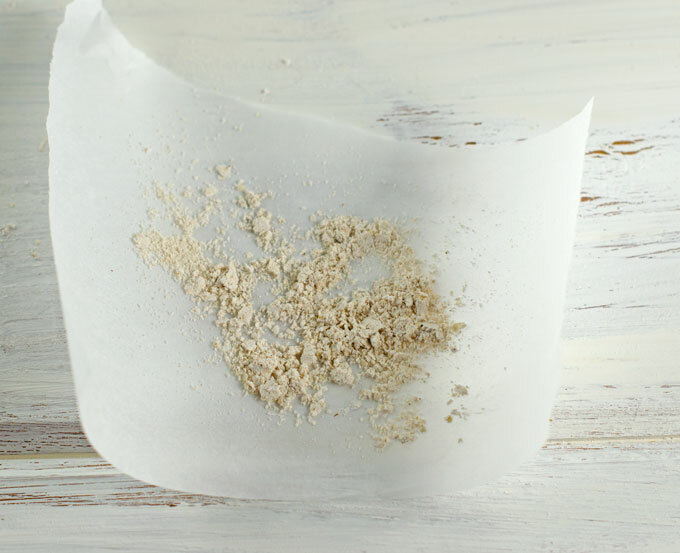 Plus, it can be a lot cheaper to grind your own flours if you’re using specialty flours to be gluten-free or have certain allergies where cross-contamination is a concern. Seeing as I am a beginner miller, I decided to start with something super easy: homemade oat flour. 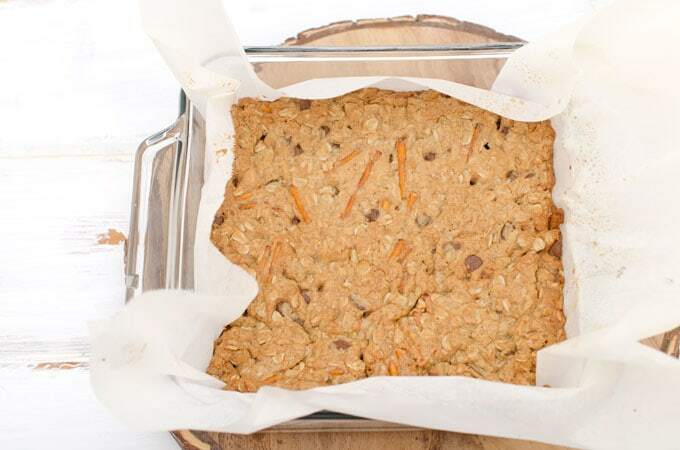 I really love the flavor of oats and have heard that you can usually substitute oat flour pretty easily for white wheat flour. Since it was my first time doing so, I started with substituting half the wheat flour for oat flour to see how the texture and consistency would be. Do be sure to read the manual before using the Mockmill the first time so you can be sure how it works (for example, you’ll be told to mill some grain to be sure the stones are clean). Also be sure to have the Mockmill attached very tightly and keep an eye on it. I left the room for a few minutes while it continued to mill but apparently didn’t have it attached quite tightly enough and came back to the kitchen to find the mill had rotated loose and had oats all over the counter and floor, eek! Ever since I have made sure to make sure it’s extra tight and haven’t had any problems since. For my first recipe, I made these oatmeal chocolate chip pretzel bars. I love the combo of sweet and salty and also chocolate and oatmeal and chocolate and pretzels so I thought why not combine them all together? I have to say, it was a success! 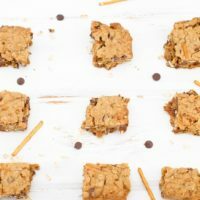 These bars are full of the oaty flavor I love, a bit of rich sweetness from the chocolate chips, and a salty, buttery, and crunchy finish with the pretzels. 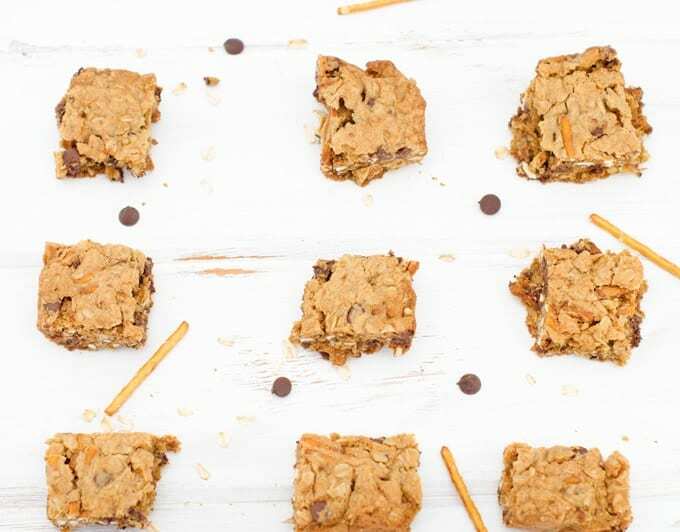 The bars have a chewy cookie-like texture that reminds you of a granola bar thanks to all the oat goodness. I can’t wait to make these again and try them as an extra special dessert with a scoop of ice cream and a drizzle of salted caramel sauce. Yum! The oat flour was also a success. If I had tasted these without knowing, I’d have no idea they were made with half oat flour. Again, if you’d like to try milling your own flour like I did for these oatmeal chocolate chip pretzel bars, head on over to the Mockmill site and use the code smartsavvyliving when checking out to save an extra $80! 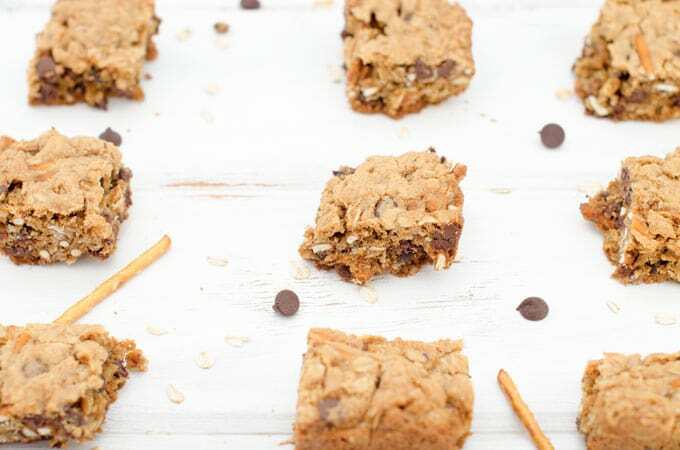 This oatmeal chocolate chip pretzel bars recipe makes for a perfect after school snack or dessert. Preheat your oven to 350°F and grease an 8 x 8 baking dish. I like to use parchment paper that I spray with non-stick spray. Brown butter in a medium-sized skillet over low heat until slightly browned with a nutty aroma. You can just melt the butter if you prefer but browning adds an extra layer of butterscotch-like flavor. Once melted, place butter in a medium to large mixing bowl. Whisk in the brown and granulated sugar until well-mixed. The mixture will be grainy. Whisk in the egg and vanilla. The mixture should become smooth. In another medium-sized bowl, whisk together oat flour, all-purpose flour, baking powder, baking soda, and salt. 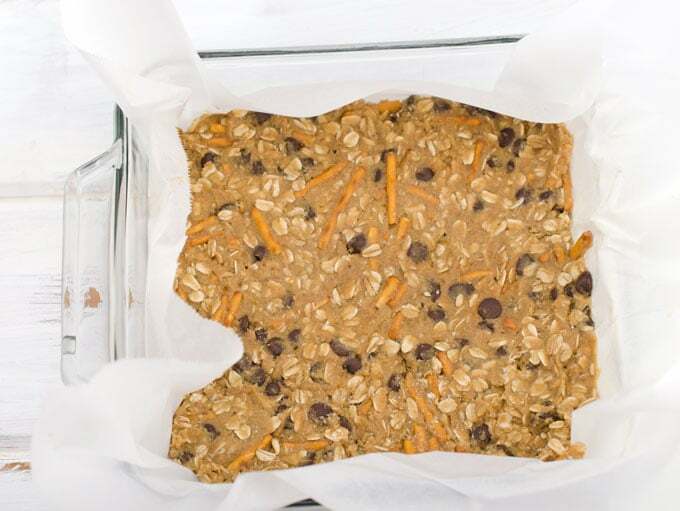 Stir the oats, chocolate chips, and pretzels into the flour mixture. Fold the flour mixture into the wet (butter/sugar) mixture until thoroughly combined. You should have a thick, wet dough very similar to the consistency of cookie dough. Pat the dough out as evenly as possible into the greased 8 x 8 pan and bake for about 25 - 30 minutes, or until the bars have mostly set and the edges are beginning to brown. Cool completely before cutting into bars and serving. Bars can be kept in an airtight container at room temperature or the fridge for up to 3 days. You can also add toasted nuts if you'd like.